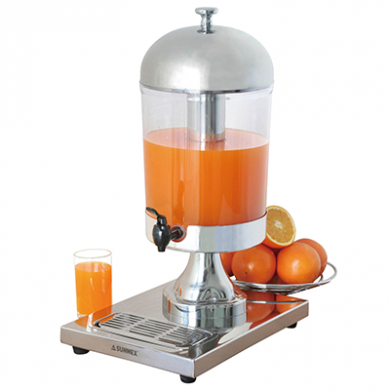 The 8 litre milk & juice dispenser offers a practical and versatile solution to breakfast service. 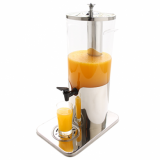 With a matt white finish and stainless steel details, this dispenser has a high quality, stylish appearance, perfect for breakfast buffets in hotels and B&Bs. An easy pull tap and mess-free drip tray make service run as smoothly as possible. Ice column to keep drink cool. Material: Polycarbonate container with stainless steel details. Central column to fill with ice or freeze to keep contents cooler for longer. Hingeless cover for easy filling. Drip tray below catches excess spills. Ideal for breakfast service in hotels and B&Bs. Keeps juice and milk at the FSA recommended temperature (<8°C) for 2-4 hours. Simply dismantles for easy cleaning.